The move follows the D.C. Council's approval of the bill in a 10-2 vote last month. It would make evasion a civil offense, subject to a fine of up to $50. Currently a criminal offense, fare evaders face arrest, jail time and a significantly higher fine. 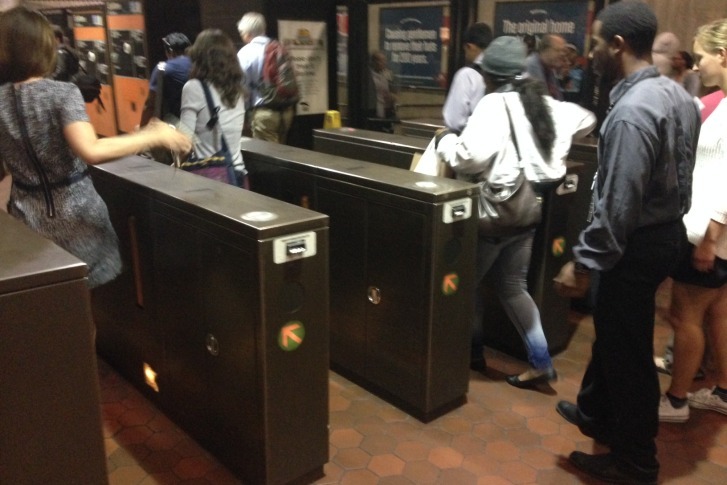 WASHINGTON — D.C. Mayor Muriel Bowser vetoed a measure Wednesday that would decriminalize fare evasion on Metro. The move follows the D.C. Council’s approval of the bill in a 10-2 vote last month. It would make evasion a civil offense, subject to a fine of up to $50. Currently a criminal offense, fare evaders face arrest, jail time and a significantly higher fine. Supporters of the bill say the current criminal penalties disproportionately affect African-Americans. Opposing the measure is the Washington Metropolitan Area Transit Authority, which cited the financial toll: The transit agency contends it loses about $25 million annually from fare evasion on buses alone. In a statement from spokesman Daniel Stessel, Metro applauded the veto. “We truly appreciate Mayor Bowser’s leadership on this issue and stand ready to work with the Council to develop solutions that address their stated goal of making Metro accessible to people of limited means, while maintaining safety and fairness for the customers we serve,” Stessel said. D.C. Councilman Charles Allen said in a statement that criminalizing “something as small as not being able to pay a $2 bus far” creates more problems for public safety. The council needs nine votes to override the veto.